These are winners. Some of the best!!!!! The guides that I made for Prairie Storms are deliciously lavished with a study of mathematics, the passage of time, seasonal study, flora and fauna taxonomy, the food web, weather patterns, a weather map, biomes, and - like the cherry atop a blob of whipped cream - a science experiment specifically created in Simple Saturday-like structure to compliment the specific weather pattern depicted in each sensational month. Yep. That's right. I'm talking twelve of those suckers. Twelve super fun, inexpensive, biome-specific scientific experiments. And...guess what...after you buy the book, Darcy's giving the guides away. Yep. Free for the taking!!!!! Click HERE for more info about Darcy, the monthly guides, and all the other stuff my little buddy's involved with. And, when you do contact her, tell her Simple Saturday sent ya. She'll get a kick out of that! When you stop and really think about it, the prairie is a happening place. There's whole heck-of-alot more to it than waving wheat fields and a sky spreading out as far as your peepers can see. Oh yeah, it's really a jungle out there, I'm telling you! 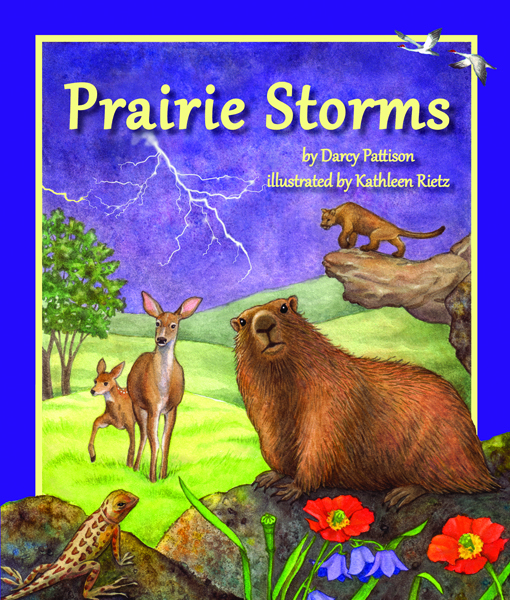 Tomorrow we're going to look at a series of guides I made for an awesome non-fiction picture book that takes a close, close look at the prairie's fab flora and fauna, as well as studying a year's worth of weather patterns. These guides were such fun to make because I learned so ding-danged much while doing so!